The New York Giants are in a position to change the course of their defense, especially after losing Damon Harrison, Olivier Vernon, and Landon Collins. Three dynamic and influential playmakers are now on to different teams and have left the Giants’ defense in pass-rush purgatory. But, the fact of the matter is, the three players mentioned weren’t as influential as most would think, considering the unit ranked as the 23rd overall defense in 2018. If that wasn’t enough to convince you that the defense wasn’t elite with those three players, 2017 saw them as the 16th ranked defense – middle of the pack. This mock draft will be different than expected, as it will change gears and focus on the defense primarily. It also indicates the Giants won’t be taking a quarterback in the first round, so you can kiss Dwayne Haskins and Kyler Murray goodbye. 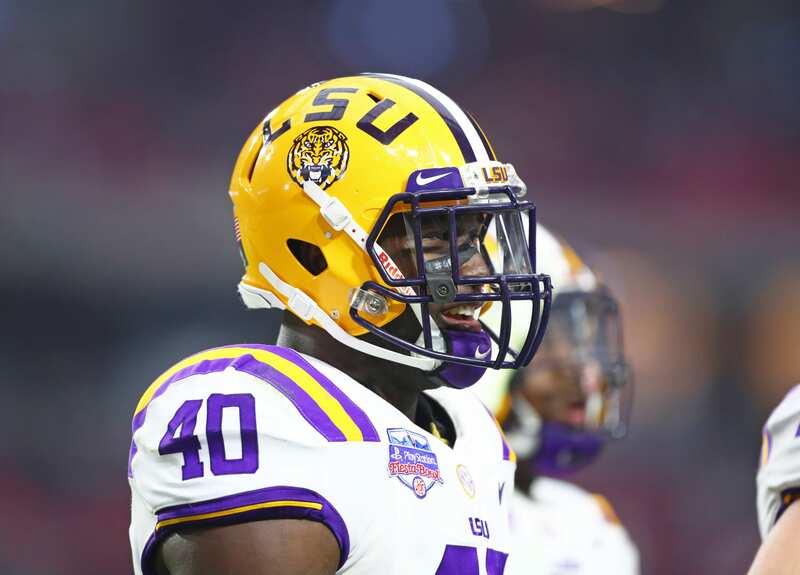 With the Giants’ first pick in the 2019 NFL draft, linebacker Devin White is the player of choice. The LSU defender brings elite strength and leadership abilities to Big Blue. He’s racked up more than 120 tackles in two consecutive seasons with the Tigers, making him arguably the best linebacker in college football. Realistically, the last time the Giants had an influential linebacker was when Antonio Pierce was prowling the field. But even he had his off-years. White it a different breed – his attributes are unparalleled and make him an easy top-6 selection if he can even make it through the top-4 picks. His ability to dominate in space and plug holes in the run game is next level, but his sideline-to-sideline range is what makes him the highest graded linebacker in the draft. White is also amendable, meaning he takes well to coaching and has the ability to change his game to improve efficiency and productivity. He would be a fantastic pick for the Giants, given they aren’t in love with any passer options. The Giants need pass-rushers, so what better option than Mississippi State’s Montez Sweat. You might not believe he will drop this far, but a recently discovered heart condition has taken a toll on Sweat’s draft stock. After doing research, it has been determined that his condition is low-risk, making him an absolute steal at No. 17. At 6’6″, 260-pounds, Sweat has an A+ frame that can pack on even more muscle weight. He has a 36-inch wing-span and 4.41 40-yard dash speed. You simply couldn’t genetically modify a more prototypical pass-rusher if you tried. Last season, he racked up 27 solo tackles with 12 sacks in 13 games. He also earned an astounding 14.5 sacks for a loss. This type of production translates well at the next level, and if he falls into general manager Dave Gettleman’s lap at No. 17, it shouldn’t even require the war room to make this selection happen. Take a look at this clip – you can see how dominant Sweat is off the edge, and this is against a more talented team in Auburn. His speed and range allow him to easily beat the opposing tackle. Developing Sweat as an outside linebacker would be deadly at the NFL level. This is where things get interesting because the Giants have strange priorities and seem to do the least expected thing every time. So, with their second-round pick, they will be taking West Virginia quarterback, Will Grier. This pick raises a few eyebrows for obvious reasons, but Grier is a born leader with immense talent. He’s a perfect fit for Pat Shurmur and his offense, as it requires the quarterback to have great touch and precision around the field. At 6’2″, 217-pounds, Grier has great size for an NFL signal caller, but it’s his intangibles that make him a winner. Grier doesn’t have A+ arm-talent, more like B+, but it’s accuracy that matters at the next level often times. His confidence shows in his game, often taking the game-winning shot rather than making the safe play underneath. Players love his mentality and play harder for him, an extremely underrated factor. The pros to his game are as follows: Grier has solid pocket presence, allowing him to slide up and avoid pressure when it comes crashing down. Additionally, he’s accurate and intelligent make pre-snap adjustments and moving through his progressions. The cons center primarily around his arm strength and quick release. His throwing motion is a bit slower than most NFL coaches would prefer, but adjusting his dynamics could solve that issue. Head coach Shurmur has had success with later round passers in the past, in fact, he helped the undrafted Case Keenum make the playoffs and earn a solid contract with the Denver Broncos. This pick would be widely criticized, but I can see why they would do it. Grier had a great Pro Day, just as impressive as the rest of them, including Dwayne Haskins and Kyler Murray. Comment your thoughts below and what your first three picks would look like! I like the first two picks. I would be pleasantly surprised if both were available at those spots in the draft. I see the Raiders scooping up White at #4 and Detroit taking Sweat at #9 before we could draft them, but not taking a QB this early would give us some very nice players at 6 and 17. Maybe Sweat or Burns at #6 and then should have some interesting choices at 17. Perhaps Ferrell, Bush Jr, or Simmons are still there? Grier at 37 may be a reach. I see taking an OT at 37. At #95 they can grab Riley Ridley or another WR that can play outside. We already have 2 slot receivers on the team, so outside guys is what we need. #108 is where I see Grier going. After Lock and Jones go off the board, I don’t see anyone wanting to burn a round 2 or 3 pick on Grier. If the Giants get antsy, they could always trade 108 and 132 to get another round 3 pick and take Grier, but I feel that would be a reach and a mistake. I would not waste a pick higher than 4th round on Grier. Rounds 4-5 the Giants have 5 picks, where is where I see them taking Grier and some developmental type players for the secondary. This is a very important place as the Giants are trying to rebuild the mess left by Reese. Love it. We still need an RT. I was hoping we’d sign a FA and have better luck then last year. Nope, White is ok, but they need a Right Tackle and a better QB than that. I would go Best Edge Rusher at 6, Metcalf at 17 and Right Tackle in rd 2.